Welcome to the Banfield Pet Hospital complaints department brought to you by HissingKitty. Experienced poor customer service? We make it easy to file a formal complaint against Banfield Pet Hospital online. Simply use our free form and your feedback will be instantly forwarded for review. 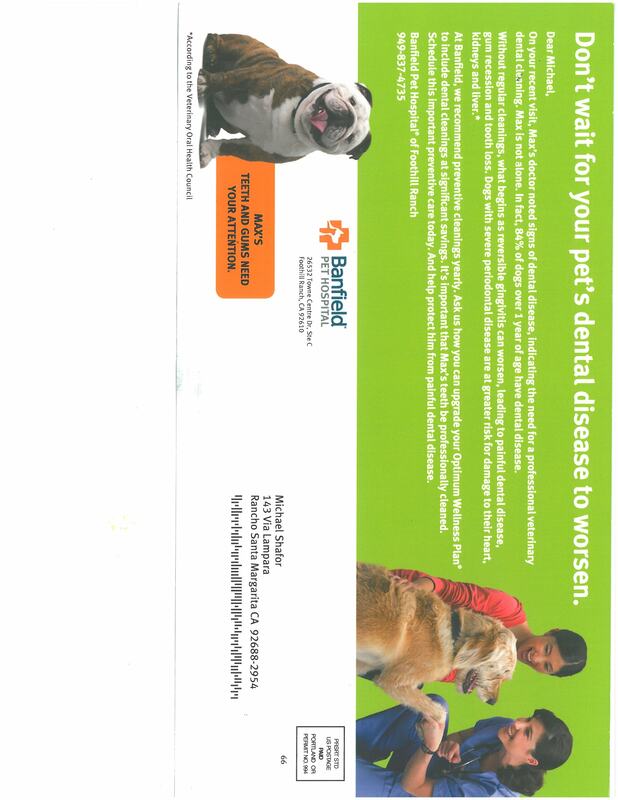 Need to contact the Banfield Pet Hospital corporate office? We have the mailing address, phone number, and email address listed below. I spent a great deal of time researched the prices of a test that my current vet wanted to give me dog but he was not able to do it until a week out. I called several vets and did a price analysis and compare the fees. I spoke to the office in Wilmington, nc twice and their price was confirmed with the medical staff. I tried to make sure the facility did not overcharge for pet services and did not extort pet owners based on their pets' illnesses. Once I got to the place, I was told the test that my vet recommended was 300 dollar and not 120. I was not happy with such an unethical discrepancy. I expressed my concern as well as the fact that I picked the place based on the information that I collected from my calls. I was told that the really needed to see the pet to give quotes. I did not get an apology or even anyone concerned that I had been misinformed and felt like a victim to this place now that I was there. I spent a great deal of time trying to find an honest place where I was not going to be taken advantage of and I wound up getting in the exact situation that I wanted to avoid. I was not given the sedative that the vet promised and the records where all messed up. Yet I paid plenty of money. I will file a consumer protect complaint against these unethical practices. We have taken Max to Banfield since he came into our family 2013. We have taken him to Banfield in Foothill Ranch, and Rancho Santa Margarita, CA. The last visit was 3/25/16. Max was stung by a bee, and Michael took him to Rancho Santa Margarita since it is closer to the house. They took him in the back and handled whatever it was. What truly concerns me is, I read what was in the folder from March 25,2016 and the paperwork had the name Max on it but the dog was 9 years old and had very bad teeth and gum issues. The next paper that I read in the same folder was for another different dog. It did not have any paperwork for our Max. We took the folder to Banfield and spoke to one of the receptionists, and she said she was sorry, but sometimes it gets so busy they just get the paperwork mixed up. What? I asked to see his chart, and she said no, but she checked the computer and said everything is in order for your Max. It did not show anything for the other dogs. Well just this week we received the attached flyer stating that our Max Shafor has bad gums and teeth and need to be taken care of as recommended by the Vet. I was stunned. Again we took this flyer to the vet and spoke to another receptionist in Rancho Santa Margarita, and she looked at it and said oh, it is just a flyer that goes out to every pet owner. I said that can not be because it specifically says that Max has bad teeth and gums and needs to have it looked at. Again she said don't worry it is just a flyer. My concerns are real. I am not comfortable bringing him back to Banfield because we do not know what they are going to do to Max if we bring him in for a check up and they take him in the back and all of a sudden put him under for to take care of something that does not even pertain to him. Our Max is a very Healthy little guy. I am afraid that we will take him in and he will come out very sick. How are we going to be certain that he will be taken care of as Max Shafor and not Max who knows what? Seems to me that the receptionists do not really care about the pets. We are scared and worried for our Max. He is part of our family, not just a dog. We would appreciate a response to this complaint. Thank you for your help in this matter. I've taken my 10 week old puppy to Banfield and the experience went smoothly. The vet and the vet techs were nice and friendly to my dog and spent the first few minutes just playing with him. I felt completely relaxed and at ease when they took him back for his examination. When they brought him back to me, his tail was wagging and his tongue was hanging out to the side, definitely a good experience for him. Will be going back there for all my puppy's medical needs. Banfield in Deptford, NJ KILLED my 6 year old Pomeranian, Missy by giving her oxygen she didnt need and stressing her out to the point that it killed her. Dr Sara Garrison and Dr Amber Karwacki DEFIED me when I told them NOT to stress my dog by giving her oxygen she didnt even need. I wanted my dog and was going to take her to my car to calm her down after they gave her oxygen without my knowledge or consent, then defied me when I told them NOT to give it to her, Dr Garrison brought me my dog for about a minute or less while I was trying to calm her down, then snatched her and said, you know what? I am putting her back on oxygen. 10 mins later, they killed her. She was still alert and walking and breathing on her own when she snatched her from me and put her BACK on oxygen KNOWING I did not want them to do that because she didnt need it and she had a heart condition and got very stressed from them doing it to her. I could have calmed her down. She was MORE stressed another day 6 months prior from a different doctor trying to do xrays. That dr didnt give her oxygen. She just gave her back to me and she calmed down and was ok. I could have calmed her down, but didnt get the chance thanks to Sara Garrison. My dog is DEAD because of them! Have feedback for Banfield Pet Hospital?